1950 - Paratroopers from the 187th combat regimental team board C-47 and C-119 planes at the Kimpo Air Field. Paratroops board and, later, parachute out of C-47 Skytrain and C-54 Skymaster military transport aircraft and a strafing run is shown and as well as a bombing during the invasion of Southern France in World War 2. 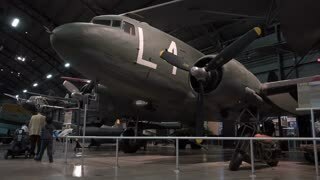 Historic military transport aircraft, Douglas C-47 Skytrain and Lockheed C-60 Lodestar flying together. Recorded in 4K, ultra high definition. 1942 - A C-47 tows gliders at an air field and lifts off as a "sky train" with them in tow. An expedition to Antarctica called Operation Deep Freeze and Rear Admiral George Dufek reaching the South Pole in a Douglas C-47 Skytrain are shown, in 1956. 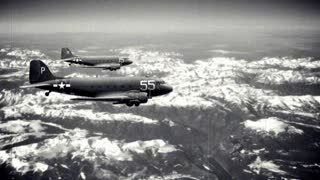 Two C-47 WWII transport aircraft flying in formation. Shiny C-47 Skytrain, WWII transport plane, taxiing towards the runway. 1942 - American paratroopers jump out of a C-47. 1943 - The Berlin Sleeper warplane is flown on a bombing mission and North American B-25 Mitchell and Douglas C-47 Skytrain aircraft are stuck in the mud in North Africa during World War 2. Silver C-47 WWII transport plane flying across clouds and patches of blue sky. Douglas C-47 Skytrain in flight. Recorded in slow motion at 60fps and partially speeded up to normal speed, clip includes a speed ramp as the plane goes past the camera. Pan to the cockpit of a Douglas C-47 Skytrain historic military transport plane, parked at dawn at an airfield. Also known as the Dakota in the UK. Recorded in 4K, ultra high definition. United States Naval Construction Battalions construct an airstrip and Douglas C-47 Skytrain transport aircraft drop supplies to troops during the Bougainville Campaign in World War 2. 1942 - A Douglas C-47 Skytrain lands, a native boy smokes a cigarette and Lockheed P-38 Lightning pilots tell war stories at a camp in Milne Bay, Papua New Guinea in World War 2. BELLEVILLE, MI, USA � AUGUST 2014: Pan to a side view of a Douglas C-47 Skytrain historic military transport plane, parked at dawn at an airfield. Also known as the Dakota in the UK. Recorded in 4K, ultra high definition. Douglas C-47 Skytrain historic military transport plane flying in cloudy sky. Also known as the Dakota in the UK. Recorded in 4K, ultra high definition.